You’ve seen the wet shave done in the movies (remember the barber shop scene in The Untouchables? ), but you can experience one in the comfort of your own home. All you need are the right tools and this simple guide. To start, apply a hot towel to your face to open your pores and zap any bacteria on your skin. Keep it on for about five minutes, then massage a pre-shaving oil (a pea-sized drop or two is all you need) evenly on your skin. The oil will allow the razor to slide easily across your face, reducing irritation. Get rid of the canned shaving gels and foams. Instead, use a high-quality cream or shaving soap that moisturizes and doesn’t contain too many chemicals. (If you can’t pronounce the ingredients, skip it.) 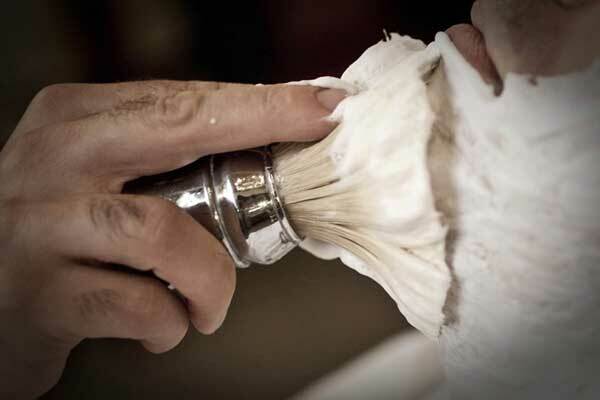 Lather up and apply it using a quality brush—think bristles made of badger or horsehair. Now comes the fun part. Use a sharp double-edged safety razor, like the kind that your grandfather might have used. A straight blade will give you the closest shave, but since it’s also known as the “cutthroat,” we recommend leaving that one to the professionals. Shave in the direction your hair grows first, then perpendicularly if your skin isn’t too sensitive. Going against the direction of hair growth will increase the likelihood of razor bumps and ingrown hairs. Voilà! Run your hands up and down your face and feel the softness. You’re done and ready to face the world.